The N.C. Highway Historical Marker Program, among the first of its kind, ensures that every county in our state has a roadside history lesson. EDITOR’S NOTE: This story was originally published in the March 2015 issue of Our State. Allow me to introduce Farquhard Smith. (Yes, “Farquhard.” Hang on.) His home played a role in the Civil War and is commemorated today by one of our state’s historical markers. Thank you, North Carolina, for presenting me with the name “Farquhard.” I can’t stop saying it. (Sometimes out loud, unfortunately.) And I keep wondering about the guy himself. He’s a historical figure, worthy of serious interest, but what I want to know is what his high school buddies called him — the obvious guess being “Farky,” but who knows. My fascination with this man’s name is juvenile, but I would argue that any response to a marker is a good thing. If I hadn’t lit up at the sight of “Farquhard” on the roadside sign, I would’ve passed by the site (northeast of Fayetteville) without knowing what happened there. I feel lucky to live in Greensboro, the city that ranks third in our state for the number of signs erected by the North Carolina Highway Historical Marker Program, and I’ve read them all. The paradox is that these signs, conceived to provide answers, really just spawn questions. I have stood motionless in front of marker J-19 in Jamestown, giving passersby the impression that it takes me 12 minutes to read 26 words. But I don’t care what they think. I’m intrigued by this marker about Beard’s Hat Shop, which was a thing in Jamestown in the early 1800s. Apparently, people really appreciated what Mr. Beard’s hats did for their heads. But why commemorate this particular shop? Surely there was an equally fine establishment that peddled socks. Who decided that hats get all the glory? There is an answer to that question. But first, consider another quandary: the marker in Greensboro commemorating the day in 1960 when four brave black men sat down at a whites-only counter at the Woolworth’s on South Elm Street. I love that moment as much as you do. But I can’t get past the fact that the marker sits two blocks north of the actual site where the Greensboro Four were unjustly denied service. Here are the sign’s actual words: J-79: SIT-INS — Launched the national drive for integrated lunch counters, Feb. 1, 1960, in Woolworth store 2 blocks south. Odd, right? The sign is in one place, and the Woolworth store is in another. The spatial laxity boggles me. But there’s more. On the other side of that same block in downtown Greensboro is marker number J-104, saluting the first steam-powered cotton mill in North Carolina. Which stood two blocks north of where the sign is. Again with the two blocks. If there is a marker committee, is it perhaps a little loosey-goosey? No. There is indeed a marker committee. I talked to Michael Hill, the supervisor of the Historical Research Office in Raleigh, about it. Hill is not loosey-goosey. He is articulate and exact. He knows so much about North Carolina that he’s something like a jukebox of history. Throw him a county name and he comes back with at least three noteworthy incidents that occurred there. He presents each story in impeccably formed sentences of admirable precision. He and the other members of the committee, all professors of history, meet twice a year to consider proposals for new markers. Ah — proposals. The seeds of new signs. Where do they come from? The 22-word rule was enacted in 1935, when underpowered cars and uneven roads kept normal travel below 40 miles per hour. In these days of fast cars and smooth pavement, you’ll need to stop and get out of your vehicle to check out a marker. If you just whiz by, you’ll struggle to read it unless you have some kind of machine that slows time. I cautiously raise my concern that some markers are perhaps unduly relaxed about the location of the events they commemorate. “We can only place markers on state roads,” he says, matter-of-factly. Well, there you go! The mundane truth is that North Carolina places markers as close to a site as it can — but regulations may well impede precision. And it’s not just government rules that get in the way. For example, the state placed a marker smack-dab inside the Guilford County house where newsman Edward R. Murrow lived as a boy. At the time the sign was planted there, the building was a burnt-out shell. Who could possibly mind that this ghost of a home included a marker about the trailblazing reporter? Somebody minded. And to be honest, I do understand. A perfectly reasonable person bought the house, and in this person’s view, an aluminum sign sprouting out of the living room floor is just plain awkward, regardless of the house’s significance to the history of journalism. You can’t argue with that. So now the marker stands a few blocks away. The N.C. Highway Historical Marker Program is, in many ways, a shining example. Ours was one of the first; it was established in 1935, when many of North Carolina’s roads were still composed of dirt. Today, the program is going strong, annually sending orders for new signs to the Ohio-based company Sewah Studios, which does nothing else but cast historical markers for states across the nation. North Carolina taxpayers pay $1,600 per sign — a pittance, in my view. These markers are treasures, and you’d sorely miss them if they were gone. There’s also the cost of repairing vandalized signs to consider — we do get our share of hoodlum-spawned damage — but Hill and his band of historical heroes, backed by the citizens of our state, forge ahead, which makes me proud to live here. Wherever you reside in North Carolina, you’re not far from one of our markers. And you don’t need to wander aimlessly until you bump into one. 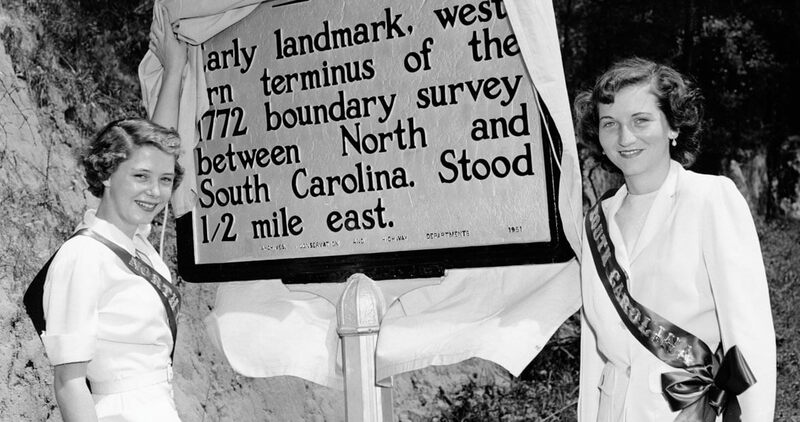 Visit the N.C. Highway Historical Marker Program’s website, and you’ll see a map generously spangled with more than 1,500 pushpins designating the locations of official markers, from the mountains to the sea. The committee has terminated markers for any number of reasons. After a storm toppled what was alleged to be the oldest holly tree in America, the committee scuttled its marker. Hill now wonders whether the marker should have been there in the first place. He suspects that the tree enthusiasts behind it might have allowed their passion for the tree to dilute their devotion to strict historical accuracy. The original marker E-33 in Franklin County was taken down, too, despite — or because of — its popularity. The sign commemorated the burial place of a state senator, William Jeffreys, whose congressional career was unremarkable but whose will contained a request to be buried in a carved-out boulder. Unfortunately, this unique tomb sits on private property; the owners grew weary of the foot traffic to and from the boulder, so the sign was taken down. But when one marker is retired, its number is assigned to another landmark. Marker E-33 now memorializes Richard Warfington, a member of the Lewis and Clark expedition. I never got around to asking Hill about Beard’s Hat Shop, so I check the program’s website to learn more. The hats produced at that shop in Jamestown were not only very popular, but they were also sold to Quakers who traveled as far as Indiana to hobnob with their co-religionists. The hats — some of which had that classic Quaker Oats look — were therefore seen and admired far and wide. Socks are worn by every random schmo, but Beard’s hats were worn by prominent people with a knack for networking. Hence the historical significance. There’s more to that story, but space is running short. Let me leave you with this observation: Marker J-19, with its inscription about the headgear of yore, prompted me to learn more about our state’s colorful history. If the goal is to get North Carolinians to investigate the story of their state, maybe all it takes is a haiku about hats. Michael Turner is a freelance writer based in Greensboro.